In 2001 Jose Puglisi and Donald Bers published an interactive computer model of rabbit ventricular myocyte ion channels and Ca transport (see the figure below). An interactive computer program, LabHEART, was developed to simulate the action potential, ionic currents and Ca handling mechanisms in a rabbit ventricular myocyte. Please click here to download the latest version of LabHeart. Since Hodgkin and Huxley published their mathematical model of the squid axon in 1952 several groups have extended this modelling to cardiac ionic currents and action potentials. Ca also plays an essential role in cardiac excitation-contraction coupling, and the dynamic interplay between the action potential and Ca regulation mechanisms has come to be included in cardiac cell models. Of the many electrophysiological models, Luo and Rudy's dynamic model (1994) has perhaps become the standard, updated with modifications based on experimental data generated by other research groups (for example Zeng, Laurita, Rosenbaum and Rudy (1995), Shaw and Rudy (1997), Viswanathan, Shaw and Rudy (1999) and Faber and Rudy (2000)). Jose Puglisi and Donald Bers adapted the equations from Luo and Rudy to rabbit ventricular myocytes using values obtained from the literature and from their own laboratory. The main differences between this model and Luo-Rudy II is the inclusion of a transient outward K current (i_to) and Ca-activated Cl current (i_Cl_Ca), as well as altering the kinetics of the T-type Ca channel (i_Ca_T), the rapid component of the delayed rectifier K current (i_Kr) and the rescaling of several conductances to match results in the rabbit ventricle. 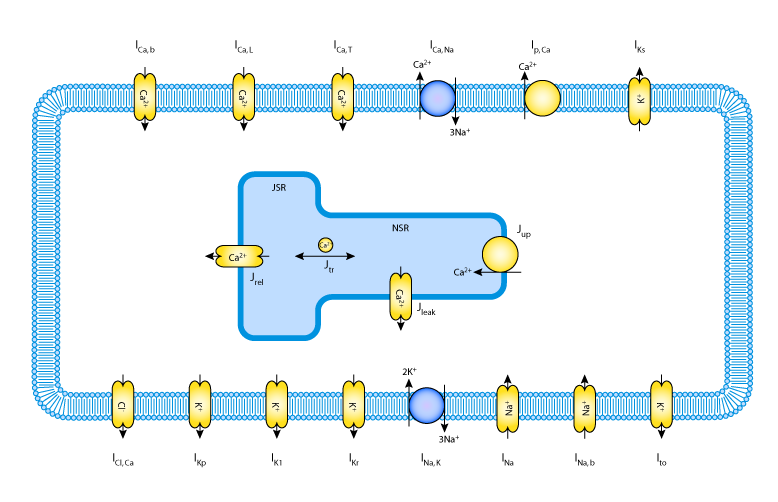 A schematic diagram describing the current flows across the cell membrane that are captured in the Puglisi-Bers rabbit ventricular myocyte model. The network defined in the CellML description of the Puglisi-Bers model. A key describing the significance of the shapes of the components and the colours of the connections between them is in the notation guide. For simplicity, not all the variables are shown. Derived from workspace Puglisi, Bers, 2001 at changeset 2e93958f348b.